Providing you the best range of brick making machines, fully automatic brick making machine, multi material brick making machine, multi-function brick making machine, semi-automatic brick making machine and chirag fly ash brick making machine with effective & timely delivery. Chirag Fly Ash Brick Making Machine Our machines, with harmonic cooperation between mechanical, electrical and hydraulic machines functions, guarantees a reliable and high production output of concrete products. Chirag Ash Brick Making Machine Our machines, with harmonic cooperation between mechanical, electrical and hydraulic machines functions, guarantees a reliable and high production output of concrete products. Chirag Hydraulic Bricks Machine Our machines, with harmonic cooperation between mechanical, electrical and hydraulic machines functions, guarantees a reliable and high production output of concrete products. Chirag Concrete Bricks Machine Our machines, with harmonic cooperation between mechanical, electrical and hydraulic machines functions, guarantees a reliable and high production output of concrete products. 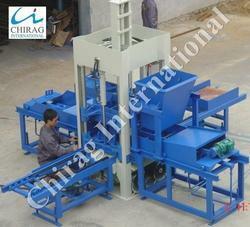 Chirag Cement Bricks Machine for our esteemed clients. These machines are designed and developed in compliance with the industry standards. Chirag Cement Bricks Machine Provided in varied models & designs, Fly Ash Brick Machines are also offered to clients at economical prices.